Our good friends at Hook Line and Sinker restaurant, overlooking our slip at the CYOA Marina in Frenchtown, can provide the perfect ending to a day on the water with Capt. Alvin. Many of our November clients had their Wahoo served up in three distinct island styles –rubbed in island jerk seasoning, smothered in creole sauce, and paired with a delicious mango salsa. Just a couple hours before, these Wahoos were swimming along the famed South Drop, about 15 minutes from our marina. Served alongside rice and veggies, as well as Hook Line and Sinker’s famous conch fritters, it’s as fresh as it gets! 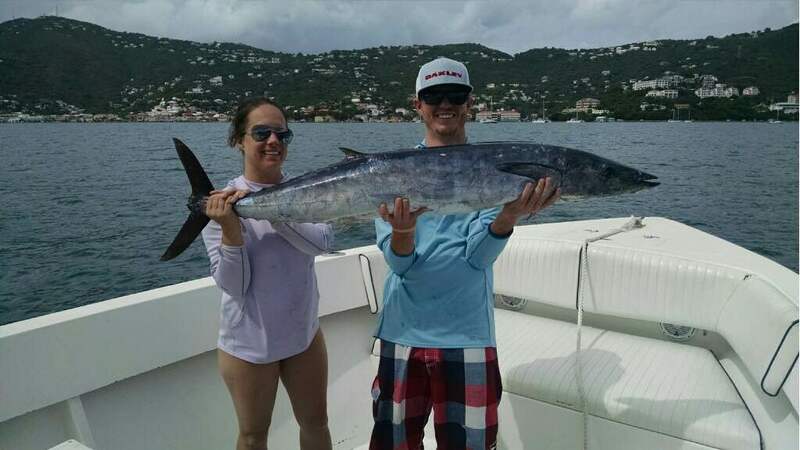 We’re currently in peak Wahoo season, with the largest Wahoos starting to make their way along the drop off near the end of December and into January. 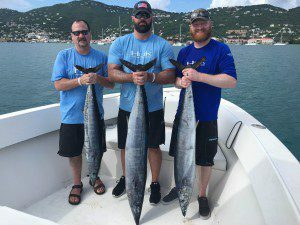 The bite has been steady to both the north and south, with 2-3 Wahoo in the 20-40lb range hitting the deck on our most recent half day and 3/4 day Offshore trips. High-speed trolling our new Ballyhood Cowbells as well as rigged ballyhoo with black and green skirts have been getting hammered on the flat line. We’ve also picked up a few school-size Mahi travelling under Frigate birds to the south…we’ll start to see the larger schools of Mahi arrive in the late-winter and early spring. Onto the inshore bite – a couple of slow days have been mixed in, typically around the larger fronts of weather we’ve experienced, but overall it has improved as we enter December. Typical of this time of year, we’re seeing a wide variety of species inhabiting our reefs and wrecks. 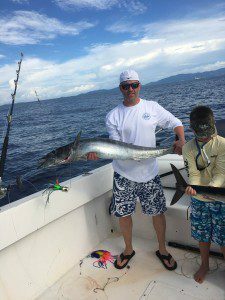 Most notable are the Yellowtail Snappers, big Kingfish, Pompano, Cero Mackerel, Mutton Snappers, Reef Sharks and Horse-Eye Jacks in the mix, all species featuring line-peeling runs and rod-bending action. Our new assortment of medium-heavy, Shimano Terez spinning rods have been a big hit with guests seeking the thrill of a light tackle battle. We hope you’ll get out on the water with us if you’re planning a visit to St. Thomas or St. John. Our springtime offshore charter slots are filling up quickly so be sure to reach out to us if you’re looking to get in on the Yellowfin and Mahi run!